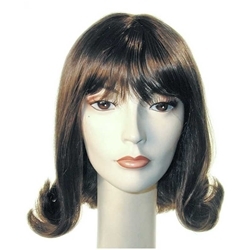 Includes one prom pageboy wig with bangs, available in a wide range of colors. The wig features an elastic band on the inside for one size fits most sizing. The banged prom pageboy creates the look of the ever popular 1960's style. It can be used for a number of different shows including Little Shop of Horrors, Hairspray, or for Lucy in You're a Good Man Charlie Brown. Don't forget a wig cap for a more secure fit and a wig stand to help organize your wigs and keep them neat and tidy."